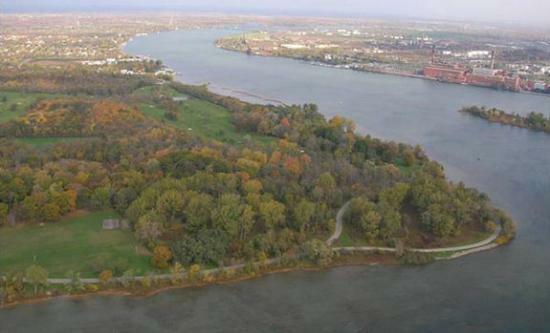 An aerial view of the southern tip of Grand Island in New York reveals Motor Island (to the right), and the archaeological toolmaking site located in the trees opposite it. An ancient campsite where people were manufacturing tools has been discovered near the Niagara Falls. 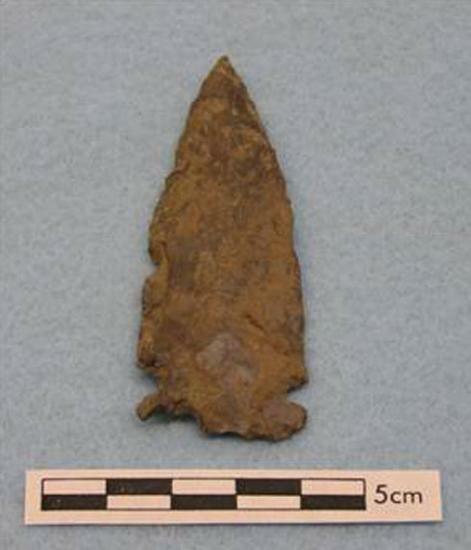 This find, combined with other archaeological discoveries in the area over the past few decades, suggests that such campsites lined the Niagara River as far back as 4,000 years ago. 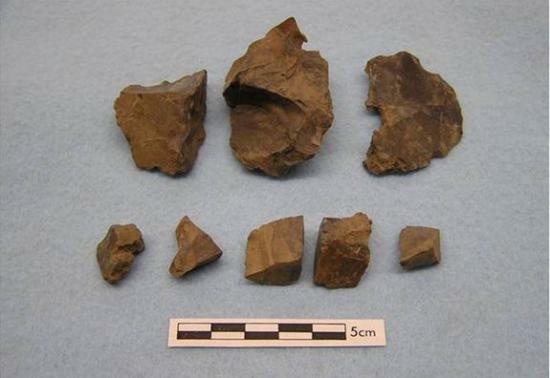 So far, the team has unearthed more than 20,000 artifacts, mostly bits of rock broken off when people were creating stone tools, on the southeastern tip of Grand Island New York, about 12 miles (20 km) upstream from Niagara Falls. The earliest artifacts at the site date back at least 4,000 years, opening a window on a time when people were living a nomadic lifestyle based on hunting, fishing and gathering plants. 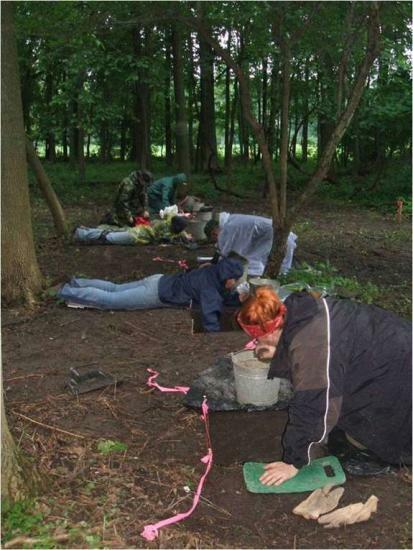 "I would anticipate that there would have been, back in the day, these kinds of campsites all along the Niagara River on both sides and on both sides of the island," team leader Lisa Anselmi, of Buffalo State University of New York, told LiveScience. 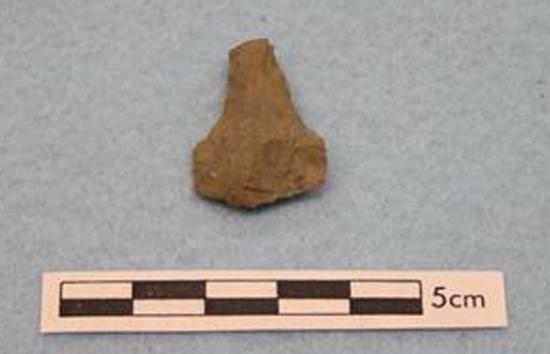 The archaeologists found that people at the Grand Island site were making a wide variety of tools, including spear points, arrowheads and even a few stone drills. Anselmi said that the drills "would be sharp enough to go through a piece of leather... or go through shell or some bone to create a bead." The team also found bits of yellow and red ochre at the site; in ancient times it was common, for religious reasons, for ochre to be applied on the skin of someone who was being buried. No evidence of burials has been found so far at the site. The south tip of Grand Island appears to have been occupied for an extended time. Fragments of pottery dating between 2,900 and 1,500 years ago found by Anselmi and her colleagues suggest inhabitants experimented with ceramic production, using pots to collect nuts and plant remains. The team also found spear points that date back around 500 years, to a period shortly before Europeans started arriving in the area. More recent artifacts included nails from houses built in the 19th century and bullets that appear to date to the 1930s or 40s. Credit: L.M. Anselmi.This spearpoint would likely have been created sometime between 4,000 and 2,000 years ago. It would have been hafted and used for either throwing or thrusting. 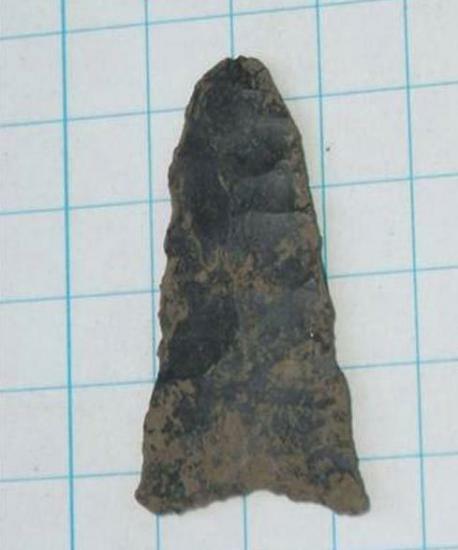 Credit: Joshua MauroThis spear point dates back to sometime between 6,000 and 4,000 years ago and is among the oldest artefacts found on the Grand Island site. It would have been hafted and could have been thrown by its user. Anselmi said that the site probably would have been used mainly between the spring and fall, when food would have been plentiful. "The island would have had the advantage of being close to the river (with) lots of freshwater fish and other kinds of resources from the river," she said. Also, "in all likelihood there would have been a very strong deer population on the island." To get to Grand Island people in antiquity would have had to cross the Niagara River. Today, the fast-flowing waterway moves at a rate of about 2-3 feet per second near the island. Curiously, rather than making use of rock found on the island, the ancient people imported a type of Onondaga chert — a tough limestone that they would have had to carry across the river from the mainland. Credit: L.M. Anselmi.These are chunks of Onondaga chert that were brought by boat to the island. People would have broken off pieces of these to make stone tools. Credit: L.M. Anselmi.The base of a stone drill found at the site. Anselmi explained that they would have brought over small bits of this rock that could then be molded into tools. "It's not necessarily that they're filling a canoe up with boulders," she said. By using Onondaga chert the people of Grand Island were continuing a toolmaking tradition that goes back to when people were first entering New York State. For instance, at a site called Emanon Pond, located in western New York, people were using the material almost exclusively nearly 11,000 years ago. "With the exception of a single projectile point made from glacially derived drusy quartz, all of the artifacts are manufactured using local Onondaga chert," write Peter Neal Peregrine and Melvin Ember in the North America edition of the "Encyclopedia of Prehistory," published in 2001. The findings were presented in May at a meeting of the Toronto chapter of the Ontario Archaeological Society.